Villa Lante at Bagnaia is a Mannerist garden of surprise near Viterbo, central Italy, attributed to Jacopo Barozzi da Vignola. The villa is known as the Villa Lante. However, it did not become known as this until the villa was passed to Ippolito Lante Montefeltro della Rovere, Duke of Bomarzo, in the 17th century, when it was already 100 years old. Since the 13th century, Bagnaia had been the personal fief of the bishops of Viterbo. The Villa Lante was thus not created by lay princes such as Orsini or Gonzagues, but by men of the Church: the Villa Lante is the work of two bishops of Viterbo who succeeded each other on the city's episcopal throne. The Villa Lante was located in an enclosed hunting park on the edge of the town of Bagnaia. Prior to the Villa Lante the park contained a hunting lodge for banquets. The designer of the Villa Lante was probably Vignola, who was also working on the Villa Farnese at Caprarola nearby. Construction of the villa commenced in 1566 by the Cardinal Gianfracesco Gambara. One of the more remarkable water elements is the Catena d'acqua, or water chain, a linear channel in the form of an elongated crayfish. The name Gambara is similar to the Italian word for crayfish and became the families emblem. The Villa Lante is formed by two casini (houses), nearly identical but built by different owners in a period separated by 30 years. Each square building has a ground floor of rusticated arcades or loggias which support a piano nobile above. Each facade on this floor has just three windows, alternating round or pointed pediments. Each window is divided by pilasters in pairs. An upper floor is merely hinted at by small rectangular, mezzanine type, windows above those of the piano nobile. Each casino is then crowned by a tower or lantern in the summit of the pantiled roof. These elaborate square lanterns too have pilasters, and windows both real and blind. Each of these casini, in their severe Mannerist style, was built by a different unrelated owner. Cardinal Gianfrancesco Gambara who gives his surname to the first casino. It appears that work commenced in 1566 on the right hand (as one enters) casino. It is thought Gambara commissioned Vignola to design the project (the villa is only attributed to Vignola), and begin the work and the design of the gardens for which the villa was to become justly famous. The first casino and upper garden were quickly completed, but work was then suspended for the remainder of Gambara's lifetime. Following the death of Gambara in 1587, he was succeeded as Apostolic Administrator of Viterbo, by the 17-year-old nephew of Pope Sixtus V, Cardinal Alessandro Peretti di Montalto. It was this mere youth who completed the project at Bagnaia and built the second casino. The two casini differ most in their frescoes: frescoes of landscapes in the Gambara and in the Montalto frescoes by a later artist in a more classical style. In the Gambara Casino the vaulted frescoed loggias are a riot of colour highlighting the architectural detail, while in the Montalto Casino the principal reception room is a combination of fresco and plaster sculpture, almost trompe l'oeil. The Quadrato is a perfectly square parterre. The twin casini stand on one side, on the remaining three sides the garden is enclosed by high box hedges. In the centre, low box is sculpted and formed into decorative patterns around small fountains and sculptures. The main feature of this parterre is the complex fountain at its centre, formed of four basins, separated by parapeted walks, the parapets decorated with stone pineapples and urns that intersect the water. At the heart of the complex, a centre basin contains the "Fontana dei Mori" by Giambologna: four life-sized moors stand square around two lions; they hold high the heraldic mountain surmounted by the star shaped fountain jet, the Montalto coat of arms. This is the focal point of this unusual composition of Casini and parterre. In the first of the ascending terraces, lodged between two stone staircases, is the Fontana dei Lumini ("Fountain of the Lamps"), a circular tiered fountain; on the ledge of each tier, smaller fountains, imitating Roman oil lamps, spout small jets of water which in the sunlight appear to blaze like lamp flames. Camellias, and other ericacious flowering shrubs added in the 19th century blaze in the shade of this terrace. On the next (third) terrace is a large and long stone table, with a central channel with water flowing to keep the wine cool. At the back of this terrace, are large sculpted river gods flanking a fountain. Directly above and supplying the water for the fountain is the catena d'acqua or chain of water, a water feature (gioco d'acqua) that can be seen in other 16th century gardens (such as the Villa Farnese and Villa d'Este); this rill of small basins allows the water to ripple down to arrive at the fountain between the sculpted crayfish claws, a reference to Cardinal Gambero's heraldic device. In the meantime, stairs flanking the catena d'acqua lead up to the next terrace. When Montaigne saw the villa Lante in 1581, only one of the casinos had been built, but the square formal garden was almost complete. On the next upper terrace are yet further fountains and grottos and two small casini called the Houses of the Muses, the sides of which frame the large Fountain of the Deluge that terminates the main axis of the garden. A roughened texture has been given to the sides of these small buildings to harmonise with the natural rough rock of the Fountain, and water conduits set in their eaves (and operated by a remote switch) project jets of water to complete a visual ensemble known as the 'theatre of the waters'. The main facades of these small casini, like their grander relations on the lower terrace, feature Serliana loggias articulated by Ionic columns, suggesting they might have been designed by Vignola. They bear the name of Cardinal Gambara engraved on the cornices. One casino gives access to a small secret garden, a garden of hedges and topiary, with a line of columns creating an air of an almost melancholic nature. A perspective plan of 1609 shows a wooded area of walks and vistas to obelisks, plus a maze. Following the demise of Lante's last cardinal owner in 1656, the villa passed to the family of Duke Ippolito Lante, in whose family it remained for many generations. In the 19th century the family, revived by an American heiress Duchess, (a daughter of Thomas Davies of New York) still lived at Lante in some style: the Gambara Casino was lived in by the ducal family and the Montalto was reserved for their guests. In 1944 the gardens and casini were heavily damaged by Allied bombing after the fall of Rome. In the late 20th century the Villa was acquired by Dr. Angelo Cantoni, who completed a long program of restoration. It is now part of the Grandi Giardini Italiani. 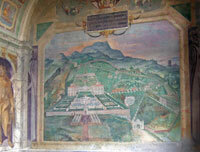 One of four large frescoes in the casino at Villa Lante which depicts contemporary Italian villas. This shows the competition between villa owners who greatly increased the scope and complexity of villa and landscape architecture in the late 16th and early 17th centuries. 'In September 1568, Cardinal Alessandro II Farnese wrote to his protégé Cardinal Gianfrancesco Gambara to tell him that Farnes'e architect Vignola was on his way to Bagnaia and ready to receive his instructions. He also wished him 'every contentment', for the Renaissance garden that Vignola and Cardinal Gambara were to devise together. The above fresco shows the grid-like plan of the garden. Within the formal garden one side is the mirror image of the other as a celebration of symmetry, the laws of proprotion and the counterpointing of circles and squares that Vignola had begun to explore at Caprarola. The twin miniature palaces replace the usual single palazzo. Wharton's comment was they are 'part of a garden scheme and not dominating it'. The garden takes centre state. The woodland (boschetto) planted with fruit trees and untended fines depicts the Golden Age of humanity's innocence and Nature's fertility. The allegory is taken from Ovid's Metamorphoses, in which he described a time 'when men of their own accord did what was right... The earth itself, untouched by the hoe, produced all things spontaneously'. The interior loggia formed by the arcade is frescoed with Raphaelesque grotesques, in the manner of the Vatican Logge. The word “grotesque” originally referred to a decorative form of Ancient Roman art. Grotesque art includes images of foliage, flowers, animals and mythical creatures, usually arranged in a symmetrical pattern. The word first was used of paintings found on the walls of basements of Roman ruins that were called at that time Le Grotte (The Grottoes) due to their appearance. These "caves" were in fact rooms and corridors of the Domus Aurea, the unfinished palace complex started by Nero. "Grotesques are a type of extremely licentious and absurd painting done by the ancients ... without any logic, so that a weight is attached to a thin thread which could not support it, a horse is given legs made of leaves, a man has crane's legs, with countless other impossible absurdities; and the bizarrer the painter's imagination, the higher he was rated". Michel de Montaigne, Travel Journal (1580–1581). Transl. Donald M. Frame. San Francisco: North Point Press, 1983. Cardinal Gambara was a model of piety and probity. He was appointed cardinal by Pope Pius IV to serve on the Inquisition in charge of heretical literature, and was subsequently made Bishop of Viterbo by the austere Pope Pius V. Initially he resided in the small castle of Bagnaia, a medieval town at the foot of the Cimini hills renowned for its mineral waters. A hunting park had been created on the hill above the town by previous cardinals, who had built a hunting lodge and an aqueduct that would provide the freshest, clearest and most admired water of any of the villas. While Cardinal Gambara was contemplating the villa and garden he wanted to lay out inside this walled park, the two great rivals, Cardinal Farnese and Cardinal d'Este, were completing theirs. The Farnese garden was monumental in its physical scale; the Este garden was stupendous in its intellectual and iconographic complexity. Cardinal Gambara, who was not a rival but a friend of both cardinals – related to Cardinal Farnese by marriage and the executor of Cardinal d'Este's will – made a garden of extraordinary sophistication on a very small scale based on the archetypal themes of man's fall from grace and his redemption. The garden at Villa Lante is the story of paradise – paradise lost and paradise regained – told in a wood and three terraces. The mythological concept of the twin peaks of Mount Parnassus and its sacred spring, home of the Muses, dominates the hillside. 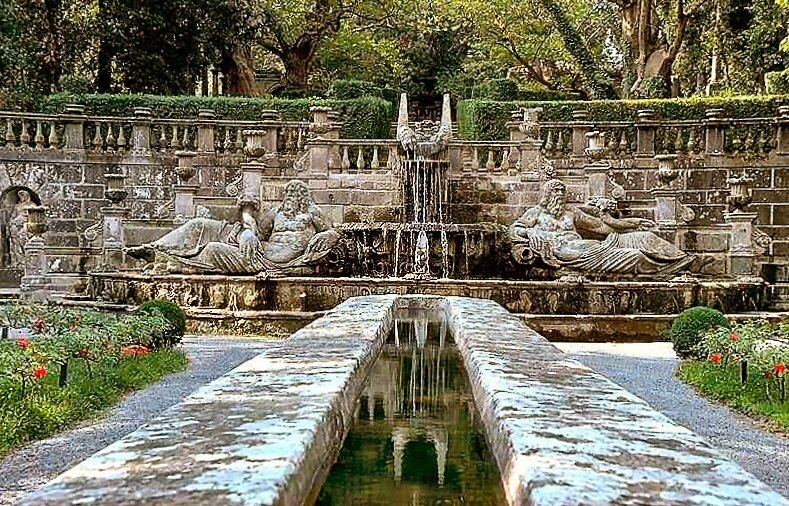 Two palazzini, echoing the peaks, prominently frame a long water chain inside the formal garden, and outside, in the boschetto, is a large pool with Pegasus surrounded by the nine Muses. These two halves make up the whole, and this duality is repeated throughout the garden. The boschetto represents the Golden Age of innocence and Nature's abundance. The garden charts the story of the consequences of original sin. Man has lost his innocence. Nature no longer produces freely, and man must live by the cultivation of' his garden and his intellect, guided and inspired by the Muses as patrons of the arts and sciences, Thus the garden honours man’s endeavours to feed his body and nourish his soul. The story is told in a sequence of terraces. Beginning at the top. the highest describes the retributive Flood as related by Ovid. “The sky god Jupiter in his anger resolved to send rain pot down from every corner of the sky, and so destroy mankind beneath the waters . . . the greater part of the human race were swallowed up by the waters and dolphins took possession of the woods . . . a high mountain, called Parnassus, raises twin summits to the stars . . . and the little boat which carried Deuclaion and his wife ran aground here.' However, humanity is eventually saved from the waters: Jupiter knew they were both guiltless, true worshippers of God . . . and he bid Neptune to recall the waves and rivers . . . and the sea had shores once more. The swollen rivers were contained within their own channels.' The second terrace celebrates the harvest and the third is a hymn to civilization, where man finds salvation through his intelligence and his creativity. The genius of the Villa Lante garden is not merely in the far-reaching complexity of its concept, but also in the way in which it makes use of the very achievements it celebrates. The triumphs of ancient Roman architecture, the laws of mathematics and proportional relationships, and the literature of Petrarch and Ovid are all there. Photo by By Paolo Villa, licensed under the Creative Commons Attribution-Share Alike 3.0 Unported license. Podere Santa Pia, a formal cloister in the Tuscan Maremma is the perfect holiday resort for relaxing and enjoying the splendor of the Maremma hills of southern Tuscany. Located on the outskirts of Castiglioncello Bandini, in a hilly and unspoilt land, Podere Santa Pia is one of the best places to slow traveling in Tuscany. Surrounded by olives groves, vineyards and majestic vegetation, the holiday farm offers a house and an independent apartment, each with modern conveniences and furnished with style, simplicity and suitable outdoor furniture. This formal cloister offers the quiet tranquility of a private retreat, with numerous attractions, beautiful nature reserves and unspoilt beautiful beaches within easy reach. Podere Santa Pia, with magnificent panoramic views of the mystical Maremma hills up to the Mediterranean Sea and Montecristo. Attlee, Helena (2006) (paperback). Italian Gardens - A Cultural History. London: Frances Lincoln. ISBN 978-0-7112-3392-8. Sitwell, Sacheverell (1961). Great Houses of Europe. London: George Weidenfeld and Nicolson Ltd. ISBN 0-600-33843-6. Viterbo is an ideal starting point for sightseeing tours and excursions following archaeological and historical itineraries such as those that wind along the route of the Via Francigena (Francigena Way), over the centuries taken by pilgrims who from the north would head for Rome. From Proceno to Acquapendente, from Bolsena to Montefiascone and then, again, past the Cimini mountains, the trail would continue to Vetralla, Capranica, Sutri and Monterosi. In the province are also worth a mention the village of Bagnaia and the famous Villa Lante, a wonderful example of late Renaissance residence with an Italian garden, whose design is attributed to Jacopo Barozzi da Vignola as well as that of the Palazzo Farnese in Caprarola, another example of Renaissance pentagonal residence. Well worth a visit also the parco dei Mostri (park of Monsters) of Bomarzo, a large park with gardens, buildings and fantastic sculptures, and the ancient village of Montecalvello, which rises around a castle where the famous Balthus, a contemporary painter, lived for thirty years. Just outside the city center of Viterbo there are the famous Thermal Baths of the Popes and the spring of "Bullicame", mentioned in canto XIV in Dante's Inferno, which feeds the big swimming pool of the "Terme dei Papi" and various other "pools". Other springs in the nearby, all belonging to the basin of the "Bullicame" flow other "pools" scattered in the surrounding countryside. In the immediate vicinity of Viterbo there is the Etruscan necropolis of Castel d'Asso and only nine kilometers far the ruins of the "civitas splendidissima" of Ferento with its Roman theatre. Ferento was destroyed by the rival Viterbese in the 1100s. Not much remains except the well preserved theater and the foundations of some Roman baths. This hilltop, which once held an Etruscan and then wealthy Roman city, was reduced to rubble. Performances and concerts are still held in the amphitheatre. Ferento can be reached following Viterbo-Bagnoregio provincial road, turning at km 7. Celleno, antico borgo medioevale, si trova all'incrocio di tre regioni: Lazio, Umbria e Toscana. Il Convento, complesso del 1610, è situato all'ingresso dell'abitato di Celleno Vecchio. The ancient village of Montecalvello rises around a castle where the famous Balthus, a contemporary painter, lived for thirty years. About 1547, Alessandro Farnese commissioned Vignola to build his villa on the foundations built by earlier architects for a castle that was never completed. The palace was "Perched at the top of a steep ascent with wonderful views." The casino resembles the Villa Lante in form, and probably in symbolism. The sequence is very similar - the source - the river gods - the cascade - the mass of buildings at the Villa Lante, and the fountain in the final space. The similarities may have been inspired by the cardinals friendship with Cardinal Gambera, the owner of the Villa Lante at the time. The Villa Lante gardens in Bagnaia is a member of the Grandi Giardini Italiani, an association of major gardens in Italy. Its members include some of the most important gardens in Italy. This article incorporates material from the Wikipedia article Villa Lante published under the GNU Free Documentation License.Wikimedia Commons has media related to Villa Lante.